A little char does a radish good. If Farmers Market Kitchen was a cookbook, I'd devote a whole chapter to grilling. While most grill-masters focus on meats — and I'll never demur a lightly charred burger, sausage or rack of ribs — prime grilling season is also prime vegetable season, and I can't help but throw all manner of greenery over the fire. Last weekend, my husband and I hosted a post-market barbecue; we served jerk-slathered ribs from Agricola Farm alongside drumettes from Maple Wind Farm and various sausages, burgers and dogs. But we also offered lots of grilled Pomykala Farm asparagus, whole dandelions (roots and all!) and Lewis Creek Farm radish greens and radishes — well salted and steeped in lemon and pepper — which were gone as fast as those glorious ribs were. They're super easy to make but need to marinate for an hour or two before grilling, so require a little planning. I prepped them first and let them sit while I readied the rest. In a large bowl, salt the halved radishes and stir well. Add lemon juice, oil and pepper and stir again. Let sit an hour or two, mixing occasionally. 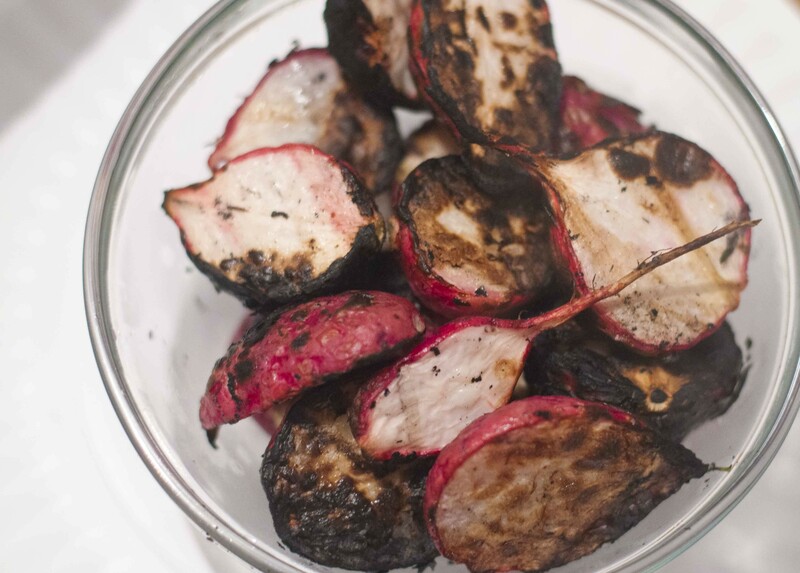 Place radishes on a hot grill but not directly over the hottest part — cover and cook, turning often, 7-10 minutes, until the skins are blistered and the bulbs soften slightly. Garnish with fresh herbs, more lemon juice or chile flakes and serve warm or at room temperature.